Last night I decided to try out some new China Glaze polishes that I grabbed at Sally Beauty last time I was there, and got out my Konad for the first time in a little over a week! 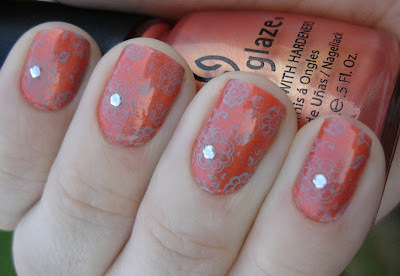 For these nails, I used three coats of China Glaze Thataway, followed by Konad plate m64 using China Glaze For Audrey. I just thought the colors looked so pretty together in the bottle that I needed to give them a chance together on the nail! I was not unhappy with the results! This is only my second time using CG - the first time being on my toes, which I have not showed you here - and I love this brand! The polish went on very nice and smooth, and had a very decent drying time. 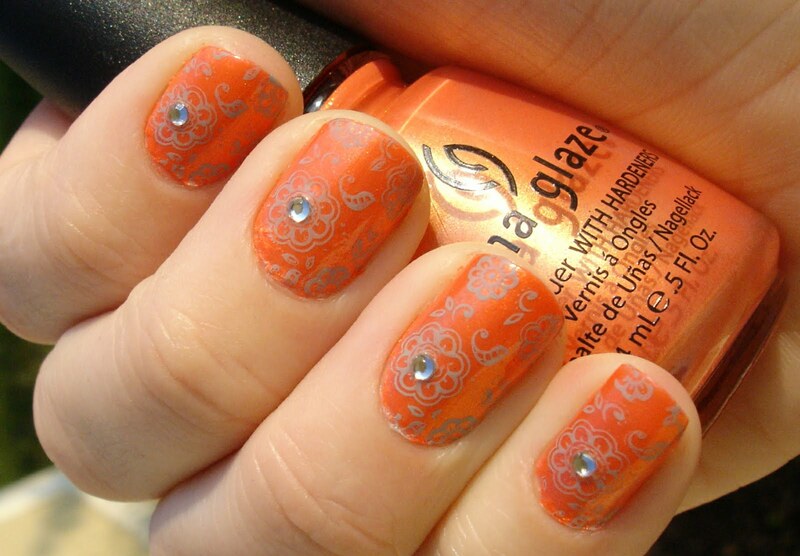 After stamping the design, I added small Konad gems to the centers of the largest flowers for a little something extra. I really like how these nails came out overall, I think they are fun and summery, which I have to enjoy these last few days of summer before fall is officially here tomorrow. Dan and I bought some new Halloween decorations last night, and I am really excited to get them up soon! I don't think I will be able to wait until October 1st. I am planning out a bunch of fun Halloween designs as well, so I am getting really excited for the fall, and the "official" Halloween time, to get here! I'll have to keep an eye out for Audrey, such a nice colour, love the flowers! It is a gorgeous color. I am excited to use it as the base color sometime soon. Glad you like it! Wow beautiful designs!!! Love your nail art. i haven't been to the blog in awhile but enjoyed catching up! my toes still sport your konad expertise :-) I especially like this mani...the color, flowers and rhinestones look so neat together! Rakhshanda - thanks so much, glad you like it!